Snow gathered at the foot of Mount Index patterns Lake Serene’s shoreline in spring and early summer. Lake Serene Trail, July 04, 2009. 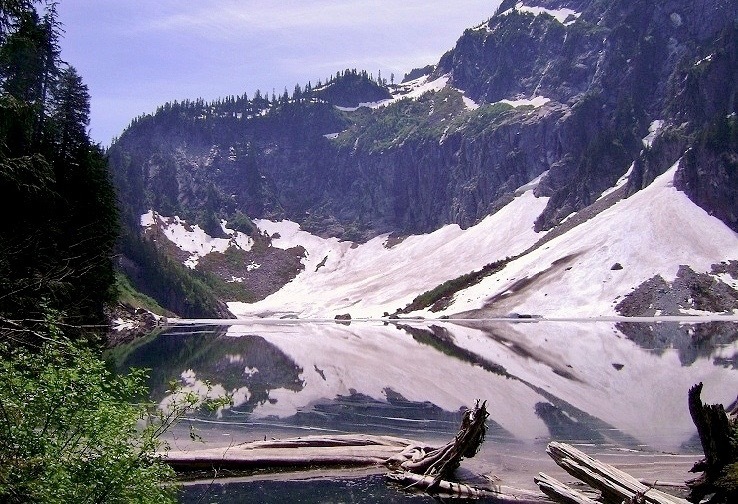 The popular trail to Lake Serene leads to a snow-lined lake pooled just beneath Mount Index’s imposing cliffs. Along the way, a short side trail offers a spray-in-your-face encounter with a massive waterfall on Bridal Veil Creek as it makes its swift descent from the lake. Bridal Veil Falls‘ impressive height is a clue to the effort required in reaching its source, as Lake Serene lies above and far beyond sight. Past the falls’ side trail, the main trail climbs consistently and steeply, rendering it a strenuous hike for many. 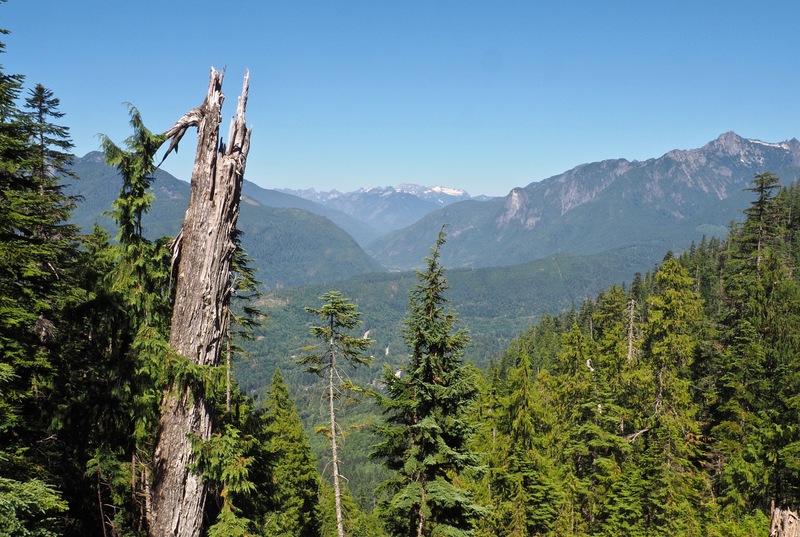 That said, the trail is well-maintained and, with a pleasant woodland wayside, unusual wildflower accents, and increasing views of the Skykomish Valley below, offers plenty to enjoy during rest stops. Expect the company of other hikers, as this trail is one of the most popular in the area. For a less peopled experience, try visiting on a weekday. 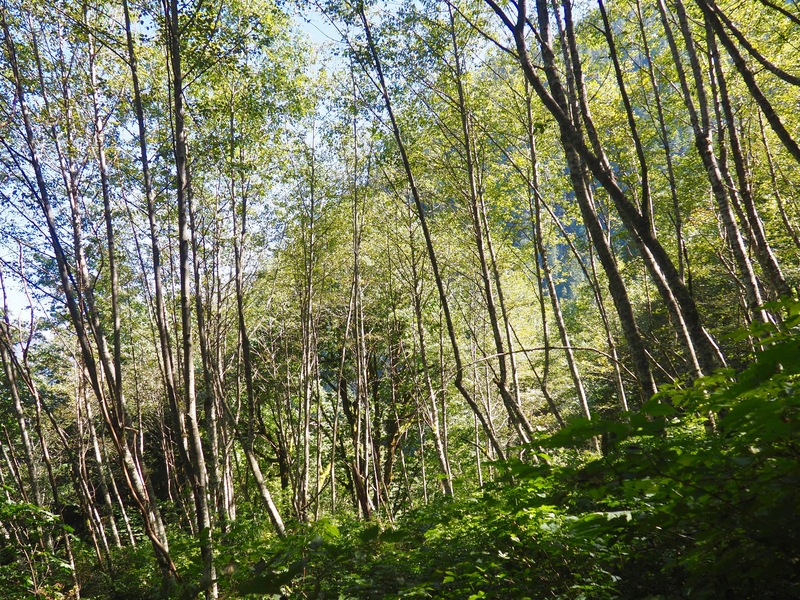 At its lower elevations, the trail climbs through airy, mostly deciduous forest. Lake Serene Trail, August 29, 2016. 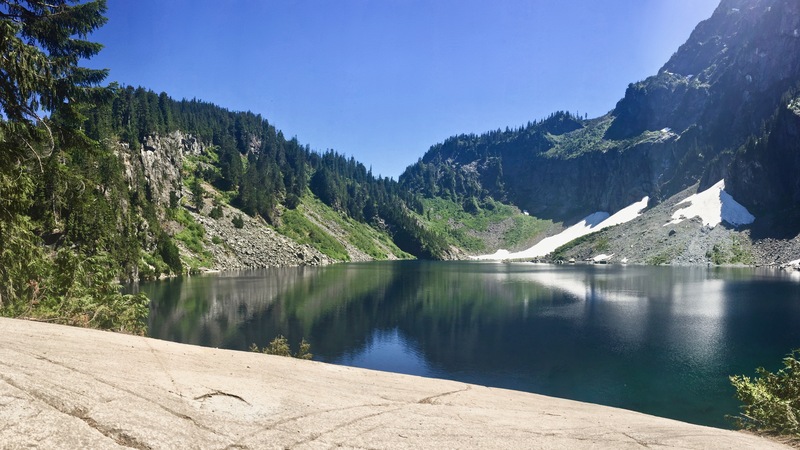 Approximately 1.70 miles/2.70 km from the trailhead, a steep, half-mile/0.80-km side trail leads to Bridal Veil Falls, where Lake Serene’s waters spill in ribbons down a 205-foot/62.50-meter cliff. Incredibly, the visible portion of the falls is neither the entire nor even tallest portion of the falls, which has a total height of 1,291 feet/393 meters. Lake Serene Trail, August 29, 2016. Beyond the side trail to Bridal Veil Falls, the wayside transitions to mostly evergreen forest and the main trail begins its steep ascent, aided by a series of stair steps. Lake Serene Trail, August 29, 2016. A few wildflowers make frequent appearances along the trail. 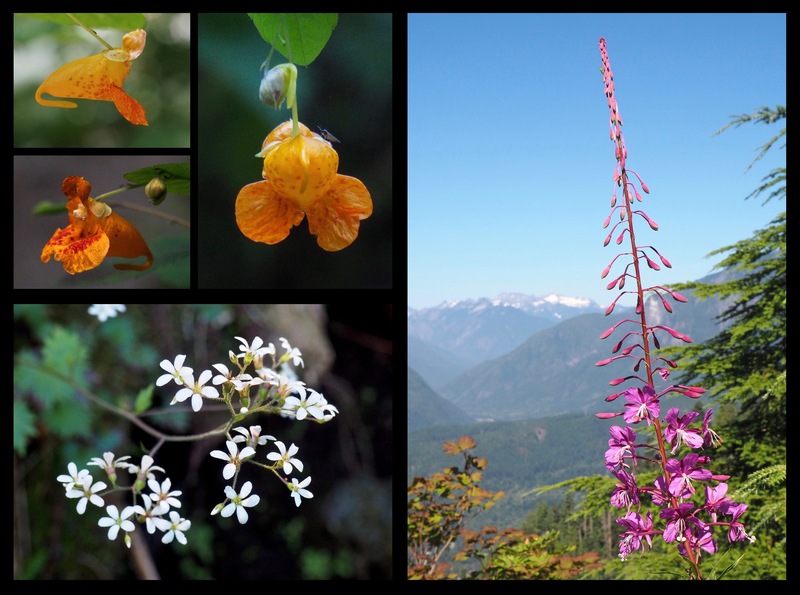 In the moist lowland woodland near the trailhead, look for the Dr. Seuss-like blooms of the cape jewelweed, or, spotted touch-me-not (Impatiens capensis) (top left photos). As the trail climbs, sprays of brookfoam (Boykinia sp.) (lower left) and fireweed (Chamerion angustifolium) (right) cheer the wayside. Lake Serene Trail, July 31, 2017 and August 29, 2016. From boulder-strewn forest clearings near the lake, views stretch across the Skykomish River Valley below. Lake Serene Trail, July 31, 2017. 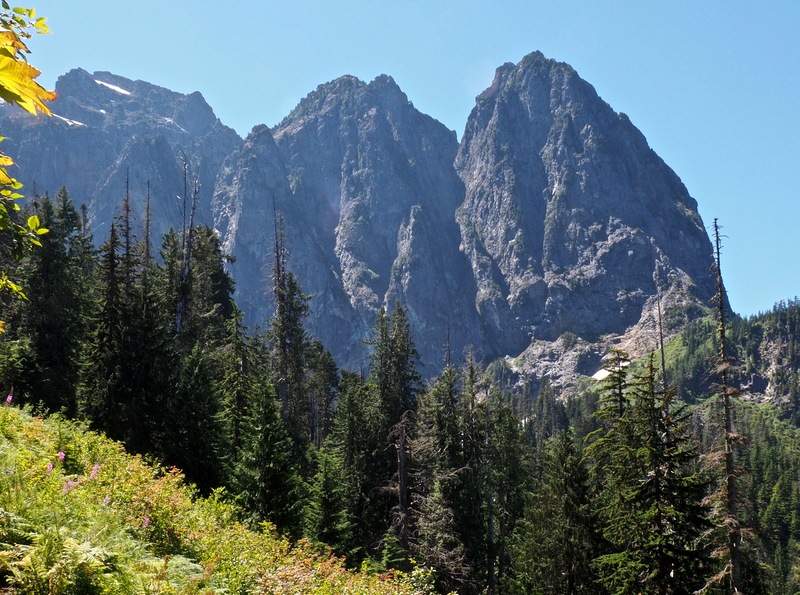 As the trail nears Lake Serene, Mount Index’s many rough-hewn spires loom above. Lake Serene Trail, July 31, 2017. 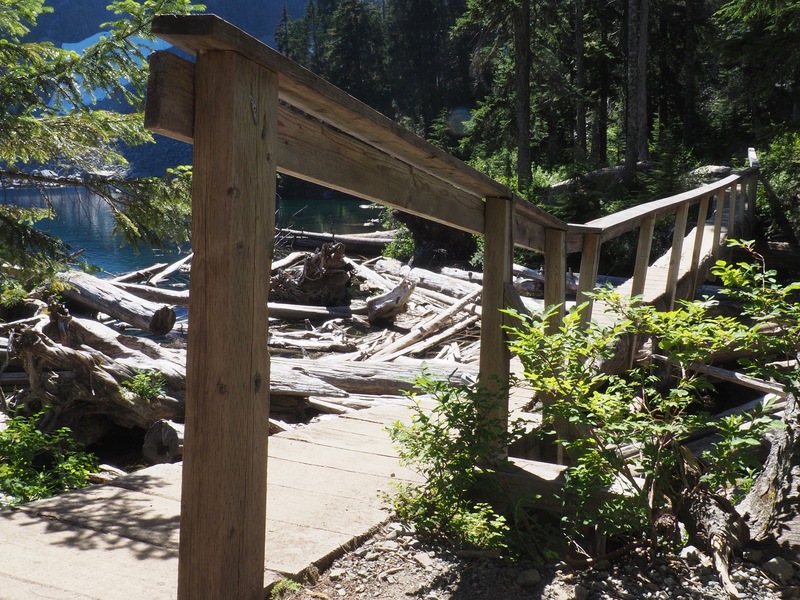 A haphazard, yet sturdy footbridge leads across Lake Serene’s outlet to Bridal Veil Creek. Lake Serene Trail, July 31, 2017. Just beyond the footbridge at the lake’s outlet, a short bootpath leads right to an overlook with a view soaring out to the North Cascades, topped by Keyes and Monte Cristo peaks on the far horizon. Lake Serene Trail, July 31, 2017. Mount Index’s rugged, often cloud-writhen spires rise dramatically above Lake Serene. Lake Serene Trail, July 27, 2011. 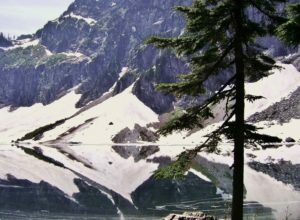 Across the feet of Mount Index, snow often lingers into summer, combining with its own reflection to create abstract patterns along the lakeshore. Lake Serene Trail, July 04, 2009. The trail ends on the large “Lunch Rock” overlooking the lake. Lake Serene Trail, July 31, 2017.